As a means of recording the passage of time, the 16th century was that century which lasted from 1501 to 1600. 1500: Portuguese navigator Pedro Álvares Cabral officially discovers Brazil and claims the land for Portugal. 1501: Safavid dynasty rules Iran until 1736. 1503: Leonardo da Vinci begins painting the Mona Lisa and completes it three or four years later. 1509: The Battle of Diu marks the beginning of Portuguese dominance of the Spice trade. 1514: The Battle of Orsha halts Muscovy's expansion into Eastern Europe. 1515: The Ottoman Empire wrests Eastern Anatolia from the Safavids after the Battle of Chaldiran. 1516- 17: The Ottomans defeat the Mamluks and gain control of Egypt, Arabia, and the Levant. 1517: The Protestant Reformation begins when Martin Luther posts his 95 Theses in Saxony. 1519- 21: Hernán Cortés leads the Spanish conquest of Mexico. 1520- 66: The reign of Suleiman the Magnificent marks the zenith of the Ottoman Empire. 1521: Belgrade is captured by the Ottoman Empire. 1523: Sweden gains independence from the Kalmar Union. 1524- 25: Peasants' War in the Holy Roman Empire. 1526: The Ottomans conquer the Kingdom of Hungary at the Battle of Mohács. 1526: Mughal Empire, founded by Babur, rules India until 1857. 1527: Sack of Rome is considered the end of the Italian Renaissance. 1529: The Siege of Vienna marks the Ottoman Empire's furthest advance into Europe. by Hans Holbein the Younger. 1531- 32: The Church of England breaks away from the Roman Catholic Church and recognizes King Henry VIII as the head of the Church. 1532: Francisco Pizarro leads the Spanish conquest of the Inca Empire. 1534: Jacques Cartier claims Quebec for France. 1534: The Ottomans capture Baghdad. 1543: The Nanban trade period begins after Portuguese traders make contact with Japan. 1552: Russia conquers the Khanate of Kazan. 1553: Portuguese founded a settlement at Macau. 1555: The Muscovy Company is the first major English joint stock trading company. 1556: The Shaanxi Earthquake in China is history's deadliest known earthquake. 1556: Russia conquers the Astrakhan Khanate. 1556- 1605: During his reign, Akbar expands the Mughal Empire in a series of conquests. 1558- 1603: The Elizabethan era is considered the height of the English Renaissance. 1558- 83: Livonian War between Poland, Sweden, Denmark and Russia. 1558: After 200 years, the Kingdom of England loses Calais to France. 1559: With the Peace of Cateau Cambrésis, the Italian Wars conclude. 1562- 98: French Wars of Religion between Catholics and Huguenots. 1566- 1648: Eighty Years' War between Spain and the Netherlands. 1568- 1600: The Azuchi-Momoyama period in Japan. 1569: The Polish-Lithuanian Commonwealth is created with the Union of Lublin which lasts until 1795. 1580: After the struggle for the throne of Portugal, the Portuguese Empire comes to an end and the Spanish and Portuguese crowns are united for 60 years. 1582: Yermak Timofeyevich conquers the Siberia Khanate on behalf of the Stroganovs. 1584- 85: After the Siege of Antwerp, many of its merchants fled to Amsterdam. 1585- 1604: The Anglo-Spanish War is fought on both sides of the Atlantic. 1588: England repulses the Spanish Armada. 1589: Spain repulses the English Armada. 1592- 98: Korea, with the help of Ming Dynasty China, repelled two Japanese invasions. 1598: The Edict of Nantes ended the French Wars of Religion. 1598- 1613: Russia descended into anarchy during the Time of Troubles. 1600: The British East India Company was chartered. Henry VII of England, founder of the Tudor dynasty. Introduced ruthlessly efficient mechanisms of taxation which restored the kingdom after a state of virtual bankruptcy due to the effects of the Wars of the Roses ( 1457 - 1509). Leonardo Da Vinci famous artist and inventor and scientist. Pedro Álvares Cabral, first European to arrive in Brazil in 22 April 1500 (c. 1467 - 1520). Zygmunt I the Old, King of Poland, established a conscription army and the bureaucracy needed to finance it ( 1467 - 1548). Vasco da Gama, Portuguese navigator, first one to sail around the Cape of Good Hope (c. 1469 - 1524). Nicolaus Copernicus, developed the heliocentric (Sun-centered) theory using scientific methods ( 1473 - 1543). Michelangelo Buonarroti, Italian painter and sculptor ( 1475 - 1564). Thomas More, English politician and author ( 1478 - 1535). Ferdinand Magellan Portuguese navigator who sailed around the world ( 1480 - 1521). 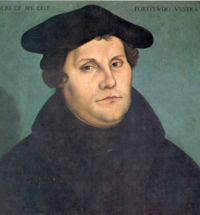 Martin Luther, German religious reformer ( 1483 - 1546). Hernán Cortés, Spanish Conquistador ( 1485 - 1547). 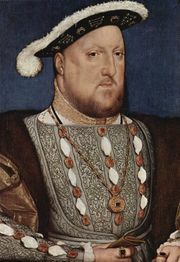 King Henry VIII of England, founder of Anglicanism ( 1491 - 1547). Ignatius of Loyola, founder of the Society of Jesus ( 1491 - 1556). François Rabelais, French author (c. 1493 - 1553). King Francis I of France, considered the first Renaissance monarch of his Kingdom ( 1494 - 1547). Suleiman the Magnificent, Sultan of the Ottoman Empire. Conqueror and legal reformer ( 1494 - 1566). King Gustav I of Sweden, restored Swedish sovereignty and introduced Protestantism in Sweden ( 1496- 1560). Charles V, Holy Roman Emperor and the first to reign as King of Spain. Involved in almost constant conflict with France and the Ottoman Empire while promoting the Spanish colonization of the Americas ( 1500 - 1558). Cuauhtémoc, the last Tlatoani of the Aztec, led the native resistance against the Conquistadores ( 1502 - 1525). Michel Nostradamus, French astrologer and doctor, author of Les Propheties, a book of world prophecies ( 1503 - 1566). Mikolaj Rej, Polish writer ( 1505 - 1569). Ahmad ibn Ibrihim al-Ghazi, Somali Imam and general ( 1507 - 1543). 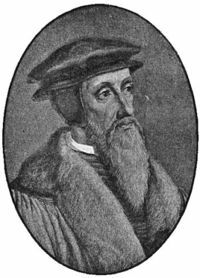 John Calvin, theologian, and reformer. Founder of Calvinism ( 1509 - 1564). Mary I of England. Attempted to counter the Protestant Reformation in her domains. Nick-named Bloody Mary for her Religious persecution ( 1516 - 1558). Luís de Camões, Portuguese poet (c. 1524 – 1580). Pierre de Ronsard, French poet. Called the 'Prince of poets' of his generation. ( 1524 – 1585). King Philip II of Spain, self-proclaimed leader of Counter-Reformation ( 1527 - 1598). Ivan IV of Russia, first Russian tsar ( 1533- 1584). William the Silent, William I of Orange-Nassau, main leader of the Dutch revolt against the Spanish ( 1533- 1584). Michel de Montaigne, French essayist ( 1533 – 1592). Elizabeth I of England, central figure of the Elizabethan era ( 1533 - 1603). Oda Nobunaga , daimyo of the Sengoku period of Japanese civil war. First ruler of the Azuchi-Momoyama period ( 1534 - 1582). 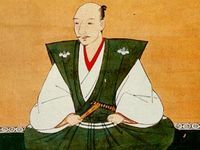 Toyotomi Hideyoshi , daimyo of the Sengoku period of Japanese civil war. Second ruler of the Azuchi-Momoyama period ( 1536 - 1598). Edward VI of England, notable for further differentiating Anglicanism from the practices of the Roman Catholic Church ( 1537 - 1553). Lady Jane Grey, Queen regnant of England and Ireland. Notably deposed by popular revolt ( 1537 - 1554). Mary I of Scotland, First female head of the House of Stuart ( 1542 - 1587). Admiral Yi Sun-sin , respected as one of the greatest admirals and military leaders in world history. ( 1545 - 1598). Miguel de Cervantes, Spanish author ( 1547 - 1616). Giordano Bruno, Italian philosopher and astronomer/astrologer ( 1548 - 1600). Lope de Vega, Spanish dramatist ( 1562 – 1635). Christopher Marlowe, English poet and dramatist ( 1564 – 1593). 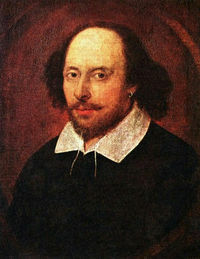 William Shakespeare, English author ( 1564 - 1616). John Ford, English dramatist ( 1586 - c. 1640). The Columbian Exchange introduces many plants, animals and diseases to the Old and New Worlds. Introduction of the spinning wheel revolutionizes textile production in Europe. The letter J is introduced into the English alphabet. 1513: Juan Ponce de León sights Florida and Vasco Núñez de Balboa sights the eastern edge of the Pacific Ocean. 1519- 22: Ferdinand Magellan and Juan Sebastián Elcano lead the first circumnavigation of the World. 1540: Francisco Vásquez de Coronado sights the Grand Canyon. 1541- 42: Francisco de Orellana sails the length of the Amazon River. 1545: Theory of complex numbers first developed by Gerolamo Cardamo of Italy. 1565: Invention of the graphite pencil (in a wooden holder) by Conrad Gesner. Modernized in 1812.